Years ago as a student at Loughborough University I got to know a talented athlete who would frequently run rings around others in training, but never seemed to hit the heights when it mattered on the track. The reason soon became clear. His training schedules were completely random and none of his performances were logged. He refused to let coaches impose any level of discipline, believing it would compromise his natural gifts, and while he gave the occasional decent performance in a race he could never be sure what had prompted it. I was reminded of this athlete and his unfulfilled talent at this week’s World of Learning event at the NEC. Exhibitors offered fascinating insights on programme development, empowerment of learners and achieving a smart balance between learning modes, but one theme stood out. If we don’t measure what works, how can we repeat it and build on it? If we don’t analyse the return, how can we sensibly invest? Speaking for CDSM, Steve Finch made the most persuasive case for defining and measuring ROI as applied to learning and development. Over two thirds of companies currently have no mechanism in place for this measurement. They may measure cost and they may measure learner feedback in some form, but when it comes to positive behavioural change and lasting impact on the business, they’re in the dark. The presentation didn’t just highlight the problems, it pointed towards practical solutions. By applying the Kirkpatrick-Phillips learning model we can look beyond rudimentary feedback and evaluate whether knowledge has been imparted, behaviour has been changed and performance has been measurably improved. 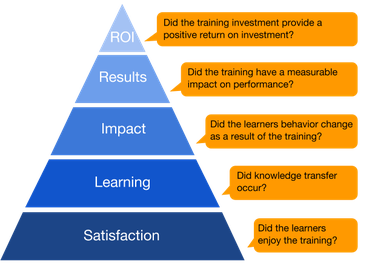 And – crucially – we can establish whether any given method of training has yielded a positive return on investment. If that makes the evaluation process sound easy, most of us realise it isn’t. It requires diligence and the will to dive deep into a client’s business needs. Before we take a client’s money and start applying solutions, we must help them define their problems. And the satisfaction of delivering measurable benefits is a very fitting reward. CDSM’s post-presentation Q&A with clients Honda and Mitsubishi reinforced the point that learning and development can only work as a partnership, and these automotive giants are clearly benefiting from a strategy that holds trainers and trainees accountable for what’s passed on, what’s implemented and what benefits accrue. The message from CDSM and from many other providers at the NEC this week was clear; when we challenge ourselves to identify core issues, address them and measure the results, we win. We win the engagement of our learners. We win the trust of our clients. Agree entirely. What is the point of a process that can't be measured? Wasn't able to attend WOL but good to know people were talking about something so practical and too often neglected. Far too much L&D is still measured only by if it stays under budget. It's not an overhead, it's an investment so don't be afraid to analyse the results. Nice article. Good - let's focus our training and add measurable value to the business whether it's elearning or classroom learning. I thought the article might end with you telling us your student friend mended his ways, won four Olympic titles and his name is Mo Farah but I'm happy enough with what you've shared here. All credit to CDSM for hitting the nail on the head. I've worked with the KP model or years and I find that it pulls me back into line when I really need it. Our work and the value we add should be quantifiable, period. Good post. Good to see the learning blend being addressed at WOL. There are times when low-tech is the best option and being open to this is an important part of being a provider. And I don't accept the argument that ROI can't be measured in classroom learning. Thanks for the marvelous posting! I seriously enjoyed reading it, you happen to be a great author.I will be sure to bookmark your blog and will eventually come back down the road. I want to encourage that you continue your great work, have a nice evening! Excellent post. I was checking continuously this blog and I am impressed! Very useful information specifically the last part :) I care for such info a lot. I was looking for this certain info for a very long time. Thank you and best of luck. Right here is the right site for anybody who hopes to understand this topic. You know so much its almost hard to argue with you (not that I actually would want to�HaHa). You certainly put a brand new spin on a topic that has been written about for many years. Great stuff, just excellent! Appreciation to my father who stated to me on the topic of this weblog, this web site is genuinely amazing. I'm impressed, I have to admit. Seldom do I encounter a blog that's equally educative and entertaining, and let me tell you, you have hit the nail on the head. The problem is something too few folks are speaking intelligently about. I'm very happy I came across this in my search for something regarding this. Spot on with this write-up, I absolutely believe that this website needs a great deal more attention. I'll probably be back again to read through more, thanks for the advice! I was pretty pleased to discover this web site. I want to to thank you for ones time for this particularly fantastic read!! I definitely savored every little bit of it and I have you book-marked to check out new things in your site. A person necessarily lend a hand to make severely articles I'd state. This is the very first time I frequented your web page and thus far? I surprised with the analysis you made to create this actual post amazing. Wonderful job! Hi everyone, it's my first go to see at this website, and paragraph is actually fruitful in support of me, keep up posting these content. What's Going down i'm new to this, I stumbled upon this I have found It positively helpful and it has helped me out loads. I'm hoping to contribute & aid different users like its helped me. Good job.